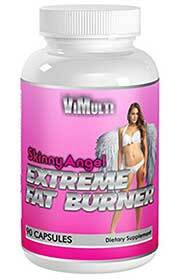 Skinny Angel is a supplement marketed under the ViMulti brand name and sold via Amazon.com. ViMulti claim the product is powerful enough for men, but was designed for women and will target fat in “troubled areas” like the belly and thighs. ViMulti appears to have a lot of confidence, proclaiming, “Skinny Angel is the best fat burner for women because it works”. Here’s, the thing, we had a hunch this product may not be all that it seems, so we did some checks. Our suspicions were confirmed. Skinny Angel is not a fat burner designed for women at all and it certainly isn’t unique. It’s a private label product manufactured by JYC Private Labelling. The company calls it Ultra Fat Fire and it’s designed for unisex use. The people who buy it can rename it and market it in any way that they want. The same pills are being sold under numerous brand names including Lady Slim 2 (Saturn Supplements), Ultimate Fat Burn (Kismet), and Lean Out Fat Burner (Ripped Quick). However, let’s forget about the name on the bottle for now. The important thing is the pills inside it and how well they work. It’s time to take a look at the ingredients and see what these babies can do. Wow! There’s a lot going on here. This is busy blend. It contains nearly 30 ingredients and a big part of the formulation is housed in a proprietary blend. There is no way to predict how such a mishmash of ingredients is likely to perform when combined, especially when so many inclusion rates have been omitted through the use of a proprietary blend. However, Chromium is a good inclusion because it regulates insulin levels and helps prevent urges for sugary and fatty food. CLA may have value too, because some research suggests it helps reduce fat mass and increase muscle mass. Unfortunately the jury is still out on this one because other studies suggest it does not. Bladderwrack is an iodine provider. So is kelp powder. Iodine is added to diet pills because it helps the thyroid to produce the hormones that govern the metabolism. If people don’t get enough iodine, the metabolism may slow down. This will cause calories to be used more slowly, making it easy to gain weight and much harder to lose it. Choline bitartrate is used as an energy provider and is believed to help the body burn fat. Gymnema sylvestre is often called “the sugar destroyer” because it can suppress interest in sweet food. Research shows it can deliver many benefits, including reduced body weight and lower cholesterol, so it’s a pretty good inclusion to have. A few of the other ingredients are also good, but some offer more disputable value and will only serve to dilute the better ingredients and weaken the blend. Four capsules are required per day and it’s best to take them with meals and wash them down with 8oz of water. The suggested dosing schedule is two capsules before breakfast and two more before dinner. The capsules are designed to aid the efforts made via diet and exercise, not replace them. Customer feedback is pretty much an equal mix of good and bad. Apart from a few reports of intestinal gas and bloating, the formulation appears to be tolerated well, but it’s not intended for pregnant or nursing mothers or anyone under the age of 18. Nor should it be used alongside other products that contain high levels of elemental chromium. People who have existing medical problems, or are using medication, should check with a doctor before using Skinny Angel or any other brand of dietary supplement. Skinny Angel is only available from Amazon.com and you won’t be able to buy it unless you are living in the USA because international postage options are not available. However, it’s possible some companies selling the same formulation under a different name may take a more international approach to their marketing. Skinny Angel has not been formulated for women. We that established at the start of this review. ViMulti are simply saying this to make the product more appealing to women. Who is ViMulti anyway? Is it a genuine company or just someone sitting at home, buying and selling pills over the internet? There is no way to know. There isn’t a company website and we were unable to find any company registration details. That’s no big point because the real manufacturer of the pills is a respected American company. So we are not talking about someone re-branding dodgy Chinese diet pills and then flogging them on. The real problem with Skinny Angel is the formulation does not look that strong. It does not contain green tea, cayenne, or any of the other most respected fat burners. Nor does it contain anything likely to provide much in the way of appetite suppression. This is a bigee for a diet pill aimed at women because researchers have discovered one of the reasons women can find it harder to lose weight than men is because the female appetite is much stronger. We aren’t going to say Skinny Angel is likely to offer no benefit at all, but customer reviews don’t suggest powerful weight loss, so ladies who have a hunger to lose weight may be better of choosing another product instead.